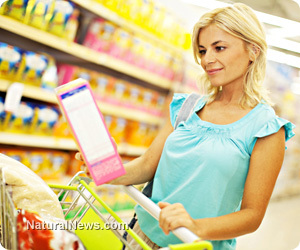 (NaturalNews) According to the new book Rich Food, Poor Food, ingredients commonly found in up to 80 percent of all pre-packaged foods on grocers shelves in the U.S. have been banned in other countries. As alarming as such information is, our food safety outlook becomes even bleaker when we consider other banned and toxic food items. In the book, authors Mira and Jason Calton provide a list of banned ingredients which they term "Banned Bad Boys" as well as the countries which have banned them. Among the items is Olestra - commonly used in low/no-fat snack foods and known to cause serious gastrointestinal issues - which has been banned in the United Kingdom and Canada. Worse is brominated vegetable oil, a substance found in Mountain Dew and Fresca which has been banned in more than 100 countries. As the authors state, brominated vegetable oil "has been linked to basically every form of thyroid disease - from cancer to autoimmune diseases - known to man." Other dangerous items listed include food colorings - such as yellow #5 and yellow #6, dyes used to make mac & cheese dinners visually appealing. Those dyes are made from coal tar, an active ingredient in lice shampoo which has been linked to allergies, ADHD, and cancer in animals. Bisphenol-A (BPA) is a synthetic chemical used to make plastic drinking bottles, baby bottles and storage containers as well as the lining of food and drink cans which can leech into foods from high heat and prolonged storage. Currently, it is found in virtually all canned goods and most baby bottles. It mimics estrogen and can offset the delicate hormonal balance in the developing child, and is blamed to be largely responsible for the age of puberty in young girls being lowered to as young as seven years old. In 2010, Canada became the first country to ban BPA. Increasing number of countries are banning the sale and/or cultivation of GM crops. Some of the GM crops are engineered to produce their own pesticides and research has shown that the genes are passed on to humans and even down to several generations after consumption. Other crops are engineered to withstand heavy applications of the toxic pesticide Roundup. Thanks in part to GM engineering, US produce contains serious levels of pesticides as well as herbicides such as Roundup and other glyphosphates. Researchers in Europe have found that the weed killer Roundup has serious toxic effects due to inert ingredients that amplify the toxicity of Roundup's active ingredient, glyphosate. As a result, Roundup is banned in nearly every European country. Due to growth stimulators such as ractopine as well as antibiotics which are added to our meats, over 160 countries say "no" to U.S. meats. Chemical fertilizers are yet another widespread problem. From 1990 to 1995, 600 different companies from 44 states sent a whopping 270,000,000 pounds of toxic waste to both fertilizer companies and farms. The waste was not treated to remove toxic substances including arsenic and dioxins. Sadly, greed and cash are kings in the US and our government is too often for sale to the highest bidder. This explains why we have a Monsanto insider over our food safety, much like we have a Merck insider over our medicines.